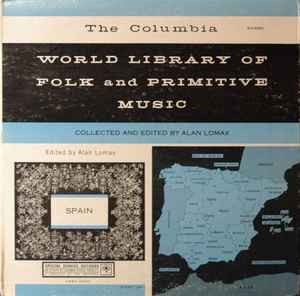 Spanish Folk Music, recorded in Spain and edited with the aid of the Museum of Pontevedra, Juan Uria Riu, Juan Carlo Baroja, Radio National, Antonio Mari, Walter Starkie. A3.1 is printed as "Corrido-Bolrero" in the tracklisting, and "Corriro And Bolero" in the liner notes. A4.2 is printed as "Larin-Lareo" in the tracklisting, and "Larin, Larero" in the liner notes. A4.4 is printed as "Dámale, majo, al toro" in the tracklisting, and "Llamale, majo, al toro" in the liner notes. A1.1: played on the pito (panpipe), Faramontes Orense. A1.3: (Muleteer Song) San Miguel del Campo, Orense. A1.4: (The Root of the Green Yew), sung by a chorus of the young men of Sobado del Obispo, Orense. A1.5: played on the bagpipe with drum accompaniment, Ribadavia. A2.1: (Goodbye my little spotted heifer) an asturianada, Aller. A2.3: Vaqueirina sung by four vaqueiro women with tamborine, castanet, and payecha accompaniment, Luarca, Asturias. A3.1: (Go to sleep, baby) Val de San Lorenzo, Maragates, Astorgas, León. A3.3: With castanet accompaniment, Santa Catalina, Astorga. A4.2: Sung by a group of five old women, Arroyo de la Luz, Caceres. A4.3: Sung by group of young women with pandero acc., Arroyo de la Luz, Caceres. A4.4: Sung by Manuela Santayana and mixed group, accompanied on guitar, ximbomba (friction drum), rabel (rebec), and castanets, Lagartera, Oropesa. A4.5: Sung by four young men with almirezes, Pegas de Matute, Segovia. A4.6: Played and sung by the orchestra of Jesus Ordoñez, Infantes, La Mancha. B1.1: With guitar, bandurria, oud and castanet accompaniment, from Cadiz. B1.2: Sung unaccompanied, Bormujo, Seville. B1.3: Performed by Pili with Sebastián Nuñez and his group, several guitars, dancers, castanets, clapping, Jerez de la Fronteva. B1.4: Introduced by military band, noise of crowd, woman soloist, recorded in Seville by Radio National, Madrid. B1.5: (Dawn and the Road), Bollullo, Seville. B1.6: Sung by a young woman, with clapping crowd, recorded in Seville, during "romeria", by Radio National, Madrid. B1.7: Recorded by Campanilleros de Bormujo, girl singer, chorus with castanets, tamborine, cántaro, platillos, triangle, handbell, Bormujo, near Seville. B2.2: With two guitars, trombone, trumpet and clarinet, Valencia City. B3.4: Sung by two men with accompaniment of flute and tabor, espadín and large castanets, inside the church, San José, Ibiza. B3.5: Sung and played by the Dansadors de Pont d'Inca with guitar, bandurria. B4.1: Sung by a group of fifty fishermen. Ondarroa, Vizcaya. B4.3: A Basque rallying or war cry. Elizondo, Navarre. Dark blue labels, "Columbia Masterworks" in goldish silver. "Long (LP) Playing" printed in the bottom of the label.